An artist her whole life, Lynn Krauss pivoted from painting to printmaking in the middle of her career and formed South Street Linen with two longtime artist friends. As Creative Director of the Portland slow-fashion brand, she collaborates with partners Mary Ruth Hedstrom and Jane Ryan to create a line of linen clothing, dreaming up colors, cuts, and prints. 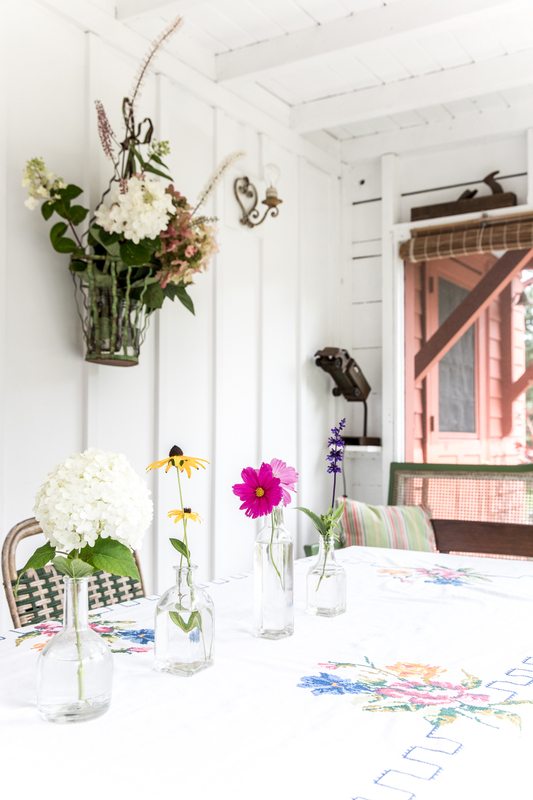 For nearly twenty years, she and her husband, architect Stephen Blatt (whose firm is above the South Street shop), have summered in a seaside bungalow on Vinalhaven, making the modest cottage their own with a blend of secondhand finds and Lynn's vibrant artwork. We asked Lynn to open up her island abode and talk to us about her work and life—and linen of course. 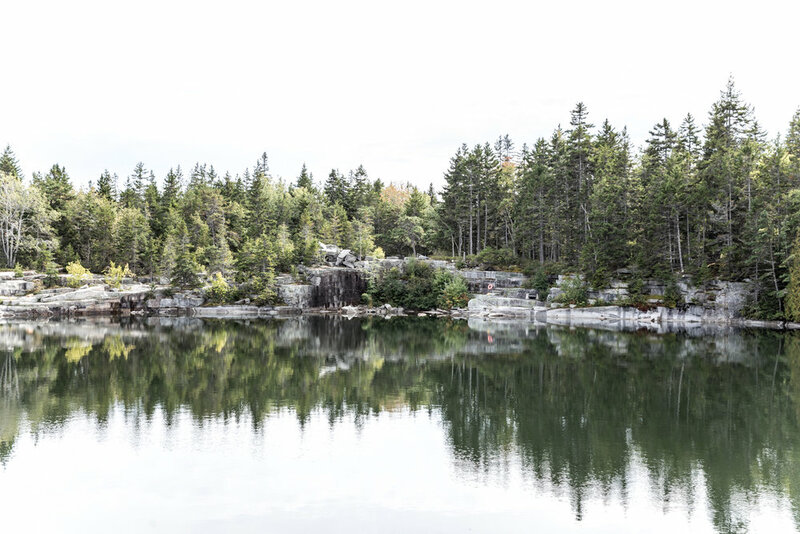 THE MAINERS: Vinalhaven is such a magical place. You’ve been coming here for nearly 20 years. What first drew you to the island? LYNN: Vinalhaven is like a throwback to the 1940s or 50s. When we first came, it seemed as though time had stood still here. It takes an hour and fifteen minutes to travel here and there are a limited number of ferries so I don't think it will ever become too populated. Knowing that we wanted to be on an island part of the year, we visited several places around Maine. 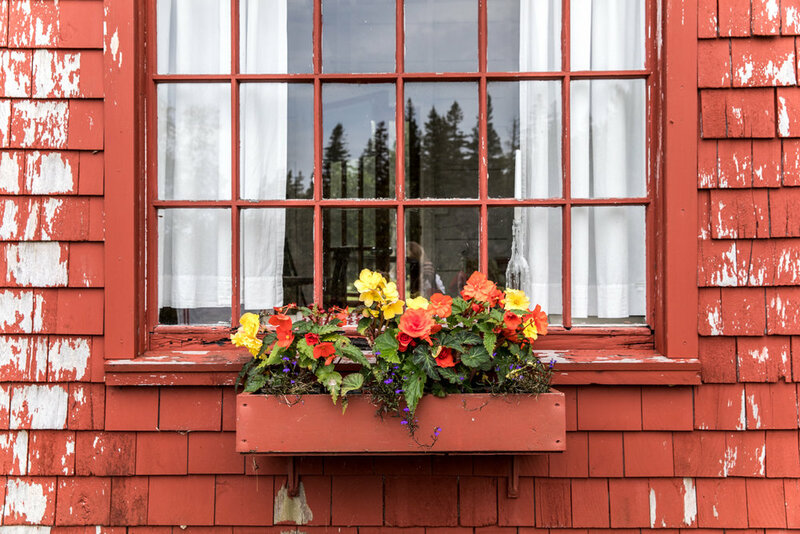 We found that because Vinalhaven is a living, working island it felt most genuine and less like a summer enclave. It has one of the largest lobster fleets in the world and a great community of year-rounders. The summer population is filled with artists, writers, and people with fascinating careers who are attracted to this island for its beauty and also the ability to keep a fairly low profile. THE MAINERS: You’re sort of tucked away up here on the northern part of the island. How’d you find this cottage? LYNN: We saw an ad in a sailing publication advertising a different house that was on the market. We came to look at it and wound up falling in love with this house, which was a stretch financially. In order to make it work, we have rented it out for several weeks each year. This was actually the first year we didn't have renters, and I spent from June to October here which was amazing. Our long-range plan is to spend about half the year here. THE MAINERS: So how did South Street Linen come about? I hear it’s a great story. LYNN: South Street was formed by myself and two longtime friends, Mary Ruth Hedstrom and Jane Ryan. The three of us were artists at the midpoint of our careers, and we would meet once a week to critique each other's work. I had just made the shift from painting to printmaking and during one of our meetings, I noticed a piece of linen Mary Ruth was wearing as a scarf. I told her that I had been wanting to print on textiles and she responded that she had been wanting to dye her collection of linen. The two of us got together in her kitchen and dyed yards of linen fabric. It was so beautiful that we sent photos to Jane, and she said, "I'll be right over with my sewing machine.” Mary Ruth and Jane pieced together the linen and I printed wood block patterns on it. We made around fifty scarves and Corey and Co. had a launch party for us where we virtually sold out! After scarves, we started branching out into home goods, runners, place mats, napkins, pillows, and aprons. We then designed an apron dress and soon after, a tunic patterned after a French work shirt. The response to the clothing was so positive that we discontinued home goods and started doing one garment after another. THE MAINERS: It’s as if the three of you were meant to do this! What has been the most challenging thing about starting a business in Maine? LYNN: Being artists, we didn't really know a lot about business. My father was in retail. He had a record shop when I was growing up. I was sure I never wanted to do that. I didn't believe I had that entrepreneurial spirit. Also, waiting for customers to come in the door and hope that they would buy your product seemed daunting. We've been fortunate that those people who like linen are out there and find us. When we first started out, we asked local business owners to help mentor us with the offer of lunch if they could answer our questions. A good friend suggested an exercise that would help us recognize our strengths and weaknesses. By making a grid of everything that was required to run the business from concept to putting inventory on the shelves, we checked off what each of us loved and hated to do and identified what our roles would be. 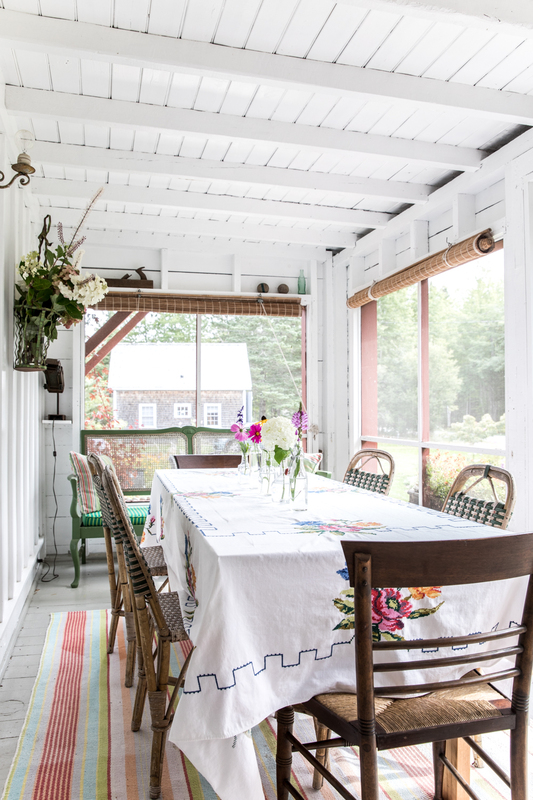 THE MAINERS: Your house has a such a wonderful cozy feel, and it’s so well curated. What’s the history of the building? LYNN: Do you know the artist Eric Hopkins from North Haven? His uncle, who was a caretaker and boatbuilder, built this house around 1918. This end of North Haven Road is called Hopkins Point. There used to be a barn on the property that served as the dry goods store for this end of the island. 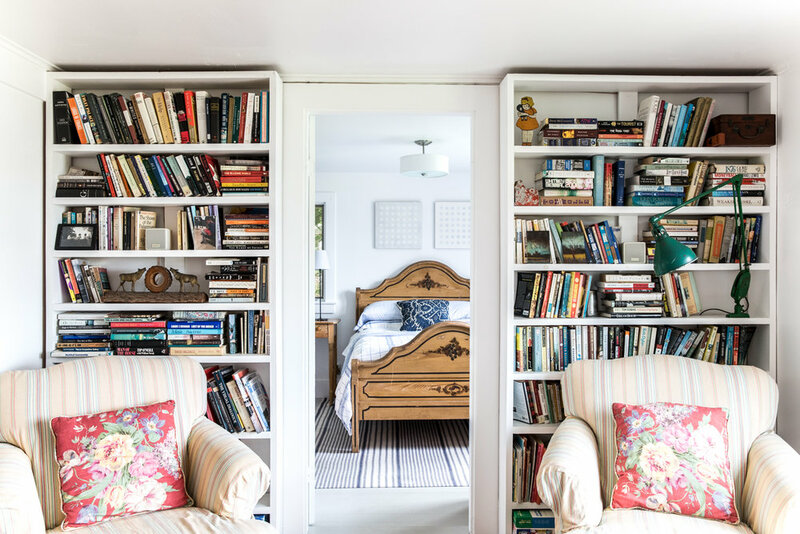 The arched doors leading to the porch were recycled from a large summer home that was torn down during the early part of the century. We turned the front of the house into a screened porch and added a pergola and patio to the water side. I feel so privileged and fortunate to have had this place for the last 19 years. The best part about having it is sharing this beautiful island with family and friends. Everything is very comfortable and faded so you don't have to worry about things getting stained or broken, especially because we have three grandsons! THE MAINERS: They must love coming here. LYNN: Oh, when they come out here, it's magical. There's so much freedom. They can run around all over town. They basically set up soccer on the lawn and play until it's too dark to see. We kayak, take the motor boat out to explore, and hike the Land Trust trails. My daughter’s husband is passionate about foraging for mushrooms. We all collect them and he makes amazing meals with them. When they visit, Steve and I move out to the guest house and they take over the cottage. THE MAINERS: You and Steve must make a really great team when it comes to creating a home—you as an artist, him as an architect—how does that work? LYNN: Steve and I are great collaborators. I worked with him in his practice as an interior designer for ten years. We have nearly identical aesthetics, he is my design soulmate. We are both influenced by Scandinavian and Japanese design and enjoy working on projects together. We are currently building a modern house in Portland, right next to the shop and his office. It's going to be very modern and minimalist, 1,200 square feet, all open. It will be very different from the cottage, but comfort is still a priority. THE MAINERS: How does your personal aesthetic influence the South Street brand? LYNN: I like saturated complex colors as well as subtle neutrals and that's pretty reflective of South Street's palette. Personally, I gravitate toward wearing black and gray with a small amount of a brilliant color, but it's important to listen to what other women are looking for. We offer a large range of color and pattern that hopefully covers a lot of tastes. Color evokes such an emotional response. We are told we have beautiful fabrics all the time. THE MAINERS: Who are some of your design icons and artist inspirations? LYNN: I've always like Carl Larsson and I think this house is reminiscent of that sort of Arts and Crafts movement. I love Tanaka Iko who was a master graphic designer in Japan. He combined a Western sensibility with Eastern design which is what I'm drawn toward. As far as architects and designers, I'm inspired by the work of Alvar Aalto, Hans Wegner, Carlo Scarpa, Ray and Charle Eames, Alexander Girard, Tadeo Ando, Sonya Delaunay, and countless others. Artists I love are Helen Frankenthaler, Sean Scully, Milton Avery, Donald Bachelor, Martin Puryear, El Anatsui, Paul Klee, and on and on. I also love folk art because many of the objects are made to be functional yet the maker goes to the trouble of making them beautiful as well. I love the primitive quality that pares them down to their essence. I also follow clothing designers, especially small businesses like ours who practice the slow fashion model. THE MAINERS: The fashion landscape is certainly changing. What role has South Street Linen played in small-batch slow fashion? LYNN: The fact that we make everything locally is very important to us. It's difficult to do because the people that supported the textile industry in Maine were active several generations ago. We are fortunate to have a talented immigrant community that have arrived with these skills and are so valuable to our success. THE MAINERS: Let’s talk about linen for a minute. I feel like there are a lot of misconceptions about it. LYNN: We spend a lot of time educating people about the benefits of linen. When people hear “linen” they often think of pastel colors that are worn in the spring and summer and clothing that requires ironing. In reality it's an enduring material that is actually fairly low maintenance. Most of our linen comes from Lithuania and some from Ireland. It’s sturdy and cool in the summer and warm in the winter depending on the weight and weave. It’s great to layer with. Despite being around for a long time, linen seems to be having its moment lately. Although we started designing for women over 40 who wanted a less tailored fit, there seems to be a movement across fashion lines for a more deconstructed style like ours. Our objective is to design clothing that women feel and look great in. THE MAINERS: When you are designing prints, what is your artistic process like? Where do you go to create? LYNN: My creative process involves a lot of ruminating, thinking about it until I land on it and commit to it and put it out there. I generally come up with a concept and develop as many variations as I can on that theme. Instead of working on a computer, I use reams of architectural tracing paper to change scale and composition. Someday, we will build a studio out here but for now I work in the guest house or sometimes right here at the kitchen table. Although the view can be distracting. THE MAINERS: You just got back from Morocco. How was it? Do you think what you experienced there will seep into your work? LYNN: Morocco was inspirational on so many levels. It is a very tolerant country that has historically welcomed refugees and woven them into their ancient culture. With that has come a rich tradition of craft which has continued for centuries in exactly the way it has always been done. Textiles, ceramics, and metal work are evident in nearly every inch of the buildings I visited. There is a real national pride because of these enduring hand crafts and a powerful sense of community. I was also struck by the kindness of everyone I encountered, particularly being an American at this difficult time. A shopkeeper friend of our guide broke into song simply for our pleasure and tea is offered countless times a day. I was inspired by the extraordinary and primitive beauty of the High Atlas Mountains and by the vibrant colors and textures of Marrakesh and Fez, and I'm certain that they will find their way into my own design practice. THE MAINERS: You have such a beautiful mix of pieces. 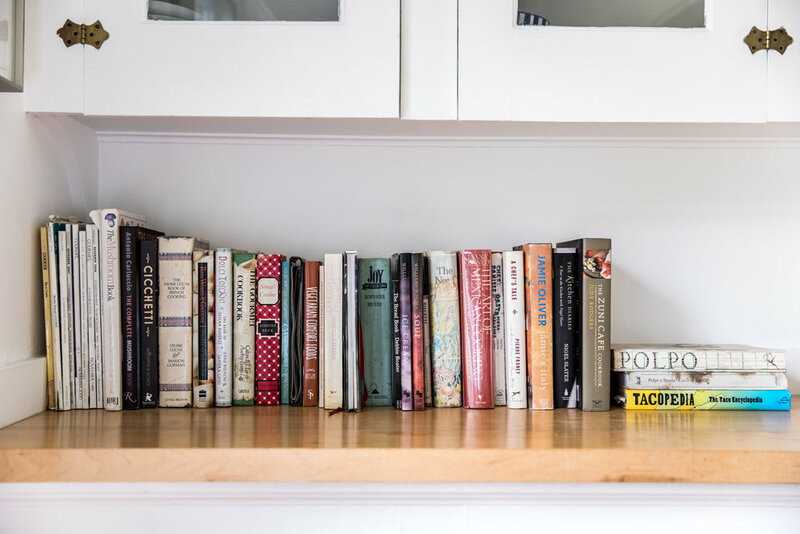 What are some of your most treasured possessions, and where did you find them? LYNN: I'm not that attached to possessions. I like to look at them and compose them, but it's the house, the view, and the gardens that are meaningful to me. Being able to share this place with family and friends is what I cherish. 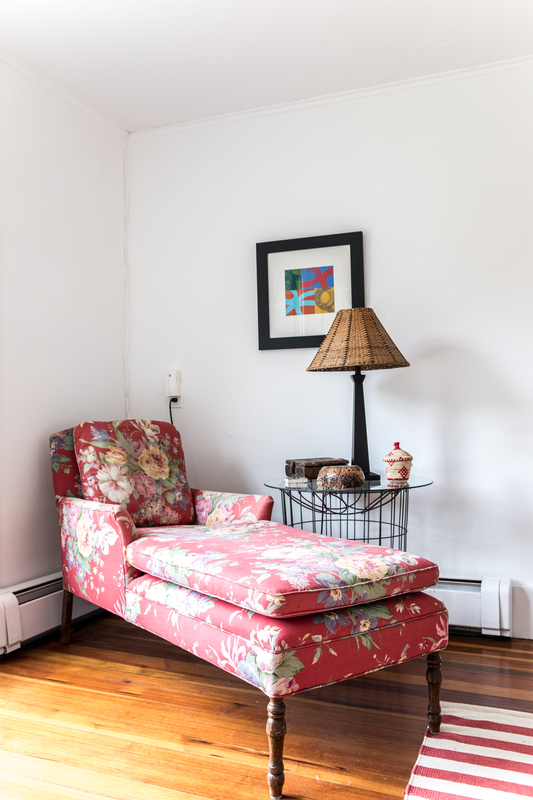 The chairs in the living room are from Marden's twenty years ago. The beds, dressers, chaise lounge, and side tables are from tag sales. The barn that used to stand on the property produced many of the objects on the porch, including the rusty toy truck welded to a base and wired to become a lamp. The two tiny wooden toys upstairs were found in a crawl space when we first moved here. I perched them on some trim so I could look at them when I go downstairs. There is a green cone on a shelf on the porch that Steve used when he was a coxswain in college. He has a long history of being on the water and I like this reminder. Books, sea urchins, sand dollars, rocks, and bird feathers left behind by people who have stayed here all contribute to the history of the cottage. One woman that rented every year for 18 years left us a gift of origami after every stay. We've kept all of them in a colorful little collection on a shelf upstairs.